Today I wore my J. 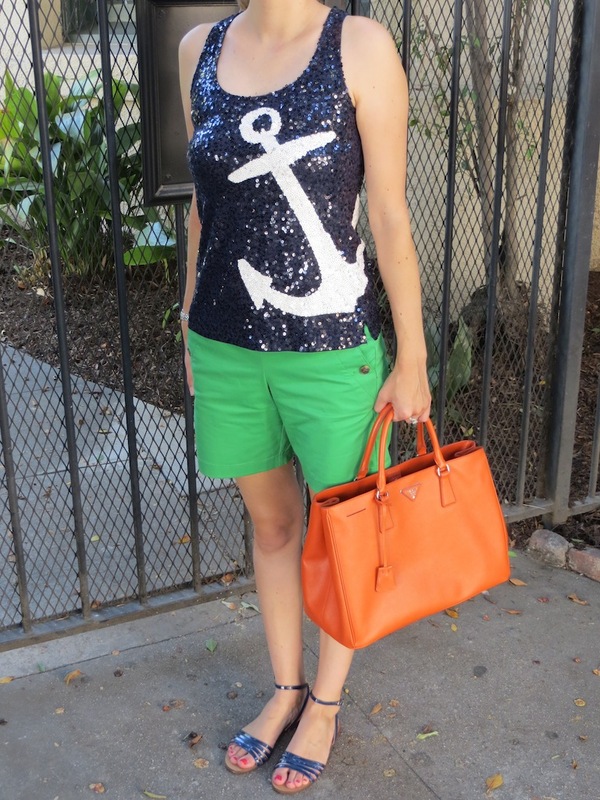 Crew sequin anchor tank and J. Crew sailor shorts out to lunch. The sequin anchor tank would fall into a category of my wardrobe which I refer to as "things my husband loathes." He tried to persuade me to return this top, but then I just pretended like I forgot. To quote Steve Martin, "I forgot!" How many times do we let ourselves get into terrible situations because we don't say "I forgot." These are words to live by. Think about how many situations you can get out of by simply saying "I forgot." My husband wanted me to explain why he doesn't like the top. 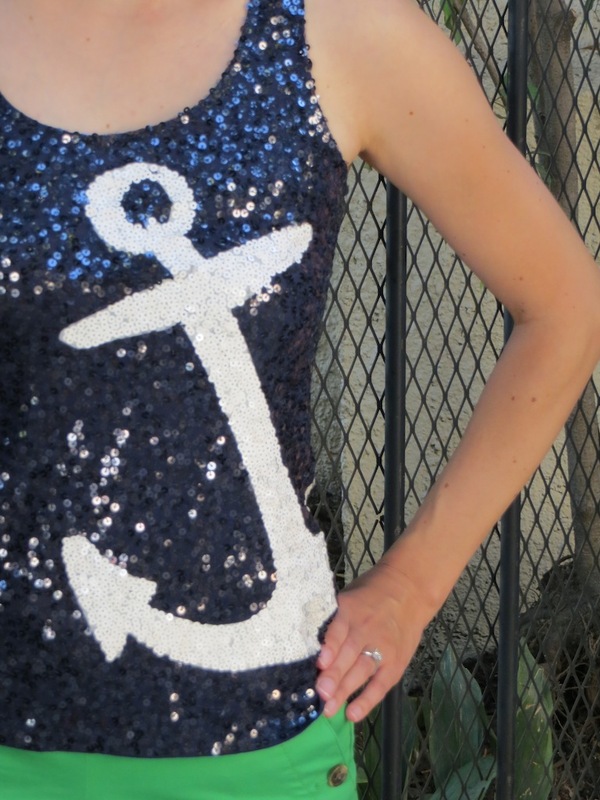 According to my husband sequins contradict the aesthetic of the nautical theme. He finds having dressy sequins in direct contrast to more laid back, beachy attire to be "ironic." Well, I understand this, but I like clothing that is quirky and unexpected. I think that is the difference between him and me. I like contemporary art and he likes the old masters. I like listening to indie music and pop and he likes Wagner and film scores. I guess that is why they say opposites attract. Besides for going out to lunch today, I also spent time retuning some other things that my husband wasn't exactly crazy about. Namely the Kate Spade Great Gatsby book clutch and an enamel giraffe bracelet from J. Crew. I realized I didn't need these things and I am going to start working on buying just a few things each season that I really, really want. Luckily I brought my big, roomy Prada Saffiano tote to keep all of my returns in! One of my favorite blogers, Phiphi, always asks a question at the end of her blog relating to her post. So I am going to try that today in my blog. The question for today is: What things do your husband/significant other hate in your wardrobe? 1) I like your tank. 2) I love the bag. 3) I have a pair of pants I wear when flying - the have ankle zippers and are a thicker cozy material that husband calls tights as pants. But really..they're not tights! Thanks Laura! Men definitely have their own perspective on woman's fashion! Thanks for stopping by Miyu! I guess my advice would be to get both! I actually love both styles equally, but to be honest, I do use my Prada Lux tote more often. On the other hand, The Epi Alma comes in some beautiful colors, but then so does the Prada bag. It's a tough call. Good luck!